We can currently print models your models in Full Color Sandstone and Sandstone. However we have made the material available for new uploads only. To prevent disappointment we won’t make Full Color Sandstone available for the existing models in our gallery. They don’t contain color information and the guidelines for 3D modeling for Full Color 3D printing differ from the guidelines for the other range of materials we have available. We will manually check the existing gallery for models that are suitable to print in Full Color Sandstone and Sandstone. When checked the material will become available in the material selection menu on the order detail page. Adding full color 3D printing to the WITII "What If The Impossible Isn't?" list. The choice of materials and colors for 3D printing is still limited, but as usual these are following the typical exponential curves upward as prices move exponentially downward. Shapeways has added "sandstone" to their options of materials and allows for greatly expanded choices of colors in any 3D models you have them print. Worth watching the video and browsing their site. The 3D scanning effect that brought us radiohead’s “House of Cards” video is now within the realm of us mere mortals thanks to the work of Kyle McDonald. In a new project on Instructables, he shows how to connect a projector and 3 cameras together to great a great low-cost 3D scanner. You’ll need a camera, a projector, and some open source software to process the image data. Using these simple tools, [Kyle] turned out much better video than before. Take a look after the break to see his results from scanning at 60 fps using a PS3 Eye. The trick to this setup is getting the correct synchronization between the projector and the camera, something that could be improved with a bit of extra hacking. 3D Capture at 60fps from Kyle McDonald on Vimeo. Very much worth watching this chunky video* (above) on how 3D scanning is entering the DIY (Do It Yourself) domain. Talk about mass personalization and The Snowflake Effect! Suddenly you can have an avatar which really IS you! Right now. With what you probably have on your desk. If you've not done so already be sure to check out the Instructables site itself for a great example of DIY learning content. And think about the implications and applications for learning, education and training. Every day we get closer to the singularity where the real and the simulated/virtual/digital become indistinguisable or one and the same. If you're not equal parts fascinated and frightened I don't think you're paying attention! Let's resolve the frightened part by guiding this in the right directions by using it for great results. School of What if the Impossible Isn't? Ted Greenwald is Tweeting from SU (http://twitter.com/tedgreenwald) using the hashtag #singularityu. Photos courtesy of Singularity University. See this article for a great set of things to add to my "What if the Impossible Isn't?" list. You may also enjoy, as I did, reading more about the recently started Singularity University and this blogging account by one recent attendee. 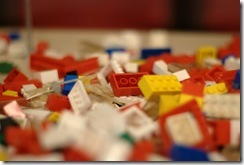 Happy 50th Birthday, LEGO™ blocks!! Those who know me, have heard me speak, or have read my writings know that one of my longtime favorite models and metaphors is that of LEGO blocks. Actually, it was my children playing with them 20 years ago that caused one of my greater epiphanies and led me to develop the concept of Learning Objects back in 1992 and I plan to post this fun story on the origin of Learning Objects here on OCOT. Although my LEGO block model is often criticized for being too simple, I still find it to be a powerful and profound one precisely because of its simplicity. So how could I NOT mention this is the 50th anniversary of the ubiquitous blocks that were introduced in 1958? According to a January 28, 2008 article on Gearlog, "There are about 62 LEGO bricks for every one of the world's 6 billion inhabitants" and "7 LEGO sets are sold by retailers every second around the world." Check out this fun timeline that Gizmodo put together on the illustrated history of LEGO. 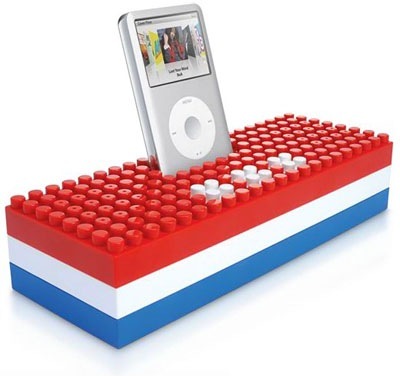 View this list from Jennifer DeLeo at PC Magazine of "The Ten Coolest LEGO Inspired Gadgets"? The list includes everything from LEGO iPod Stereo Speakers, a homemade LEGO MP3 player, a hard drive, a watch and a USB charger. I've also previously written about "The LEGO of Gadgets" and the LEGO-like attributes of the fun electronic components from Bug Labs that you can literally snap together to create your own new devices. Check it out! Makes infinite scalability a practical reality. It addresses what I've previously referred to as "Living in a World of Exponential Change" and "The Snowflake Effect" of mass personalization at a global scale by enabling you to create infinite new combinations or "assemblies" that are entirely (though not necessarily) created from pre-existing blocks. Is based on having a large collection of very, very small "blocks" that can be created in advance of a given need or use. This is a key part of enabling a strategy of "readiness for the unexpected" and dealing with exponential rates of change. Adds to the "pool" of blocks for future reuse and re-purposing, because in many cases the creation of new assemblies causes new blocks to be made. The "blocks" can come from any source at any time and with no need for any pre-agreements or design. It can stand by itself, ready for use. It would almost never be used by itself, since it is too small to be of value on its own. It enables models that cover both ends of the spectrum, providing for maximum repurposing AND maximum relevance and personalization. And just to be clear, these "blocks" and this LEGO block model can be applied to literally anything and is certainly not limited to content. For example, I've worked with others to develop applications of this same model for human competencies, software, music. You can also see examples of "hard" objects, such as those in the top ten list mentioned at the beginning. 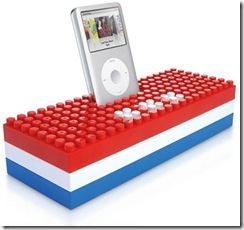 What applications or ideas do YOU have for the application of this LEGO block model? Happy 50th Birthday, LEGO! I, for one, am planning on using you more than ever in the next 50 years AND I plan on being here to help celebrate your 100th anniversary! Chris Anderson’s* fun new site “GeekDad” covers 3D printing and 3D scanning in his recent post “Is home 3D scanning and printing within reach?”. 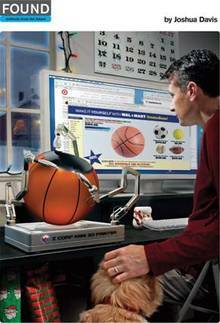 Peter Wayner’s “Beaming Up 3-D Objects on a Budget” in the New York Times, April 5, 2007. 2. Click on the “Gallery” tab in the top navigation bar. 3. Choose “Han and Jabba” from the gallery. You can also view a movie of the post processing of the scans into Autodesk 3D Studio Max. 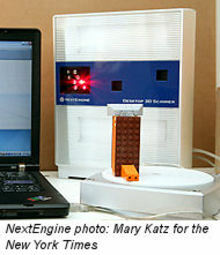 Or you may want to read this more detailed review of NextEngine from Prototype magazine that has a good set of images and description of the whole process. To scan very large objects, such as cars, you can use hand-held devices that work more like a camera but record the object’s surface in 3D rather than a flat 2D picture. Check out this informative video from Zcorp, which demonstrates how their handheld 3D scanner works. On the output side, 3D printing creates physical objects from 3D digital models. Just as with the 3D scanners, the price and size of 3D printers are dropping dramatically. 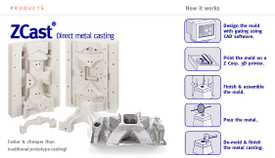 Desktop Factory is making a low cost 3D printer that sells for $5000 to $7000. Take a few minutes to check out the video from Zcorp that vividly shows a 3D printer in operation. Believe it or not, printers such as this one from Zcorp actually use the same kind of dot-matrix process as 2D paper printers, except that they just use plastic and other materials instead of ink and they build up the full object in multiple (hundreds to thousands) passes. This process is currently limited to using materials (3D ink) such as wax, plastic, and ceramics. However, it is also possible to use 3D printing to create molds into which molten metal or other materials can be poured or injected. This enables a much greater range of materials to be used in creating 3D models. Think about this as the equivalent of adding “color” to 2D printing. So now you can have 3D printed models made from metals such as gold, silver, cast iron, and brass. For larger objects and to provide more choices of materials, Minico Industries and other companies are offering to do this 3D printing as a service. Great Eastern, for example has a full set of those machines from Zcorp that I described above. You just send them the 3D digital model files and they send you the real thing in the mail overnight or within a few days. Think of it as the modern version of sending your film away to be processed and having the prints returned to you in the mail. As with photo processing, eventually most of these 3D printing shops will be displaced by the ability to just do it yourself yet they will retain some services for high-end and more complex jobs. Speaking of complex objects and assemblies, note that these 3D printing capabilities are NOT limited to creating single part objects—even more amazing! For example, in the 3D printer video mentioned above, they can make complete models of very complex assemblies, including things like fully functional ball bearings, engines, and buildings. All of this can be done in full color and can include regular 2D printing on the 3D objects for things like labels, logos, etc. As is noted by several of these manufacturers, 3D printing is really all about extending our abilities to communicate. In this context, if picture is worth a thousand words, I wonder how much a full and real 3D model is worth? Perhaps even more vexing are the challenges in working with 3D design at all. First, when it comes to human computer interfaces, we are still living in a very “flat” world. We are still stuck with EXTREMELY two-dimensional ways of interacting with digital models using things like mice, keyboards and flat screens. Second, we still need to see a major increase in such things as haptic feedback or force feedback where we can literally FEEL the virtual or digital models in our hands. Imagine having some digital clay or Lego blocks that you could pick up, feel, assemble and shape. 3D printing and scanning help dramatically with bridging the physical and digital worlds, but the interface challenges remain largely unresolved. However progress IS being made. Recent examples include some mice that enable you to “feel” the edge of a shape or a highlighted word by transferring motion to your hand as the cursor runs over these things on the screen, and some of the new game controllers vibrate or otherwise simulate “real” effects. The new Nintendo Wii console with its Wii Remote controller is particularly interesting for this feature and in one example, it enables you to “really feel” the virtual tennis ball when you hit it with your virtual racket while swinging the real “Wiimote” in your hand. 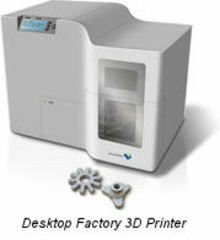 “3D Faxing”, which enables you to “send” a physical part to a distant location. It is not quite the equivalent of teleportation, such as in the well-known Star Trek line from Captain James Kirk, “Beam me up Scotty”, but it is here now and it’s increasingly affordable, so I’ll take it! Jewelers being able to sit you down and design the perfect ring, bracelet or watch and then “print” it for you, all at the same visit. Creating 3D portraits of yourself, your family or your pets. But my favorite scenario of late is an image from one of my favorite features in Wired magazine. Their back page is reserved for “FOUND: Artifacts from the Future”. Just imagine that you could go online to find “just the right thing” for you or someone else, and not only order it online, but then have it “manufactured” right on your desktop, right before your eyes, right now! Or imagine that your local hardware store could be reduced down to a small vending machine or service window capable of producing just the right screw, nut, bolt, hinge or other parts for you on demand in minutes. Sure… this kind of production would be more challenging for objects that are complex assemblies, like a vacuum cleaner or a camera, and so these might require that you pick them up just down the street from where you live. BUT, note how this takes us right back to where I started, which is the increasing role each of us will play as a “designer” as we utilize these kinds of technologies and services to build unique products for each of us as unique individuals in unique situations. THIS is what the Snowflake Effect is all about. Think about it and stay tuned for MUCH more on these topics here at Off Course – On Target. 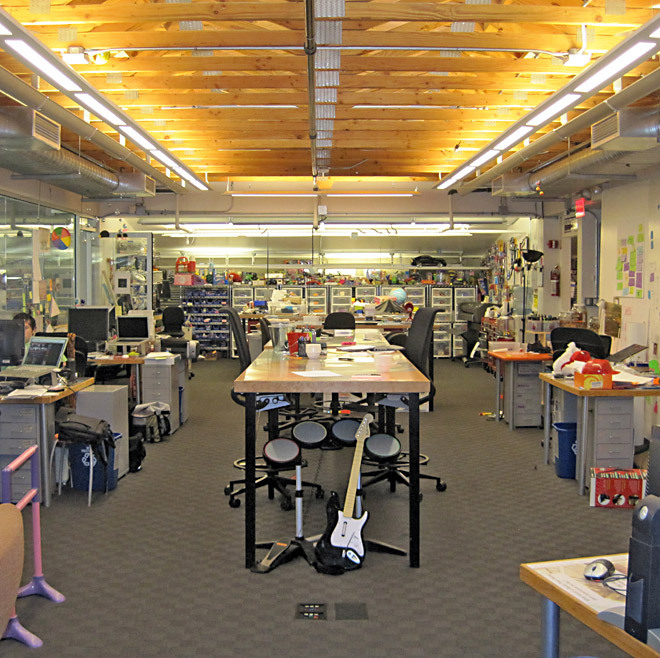 · The Long Tail blog. If it's Tuesday… this must be Salzburg?! 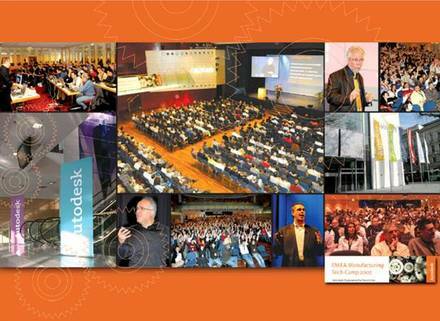 I was recently asked to make a detour to Salzburg to do the keynote for Autodesk “TechCamp”, the annual meeting of all the partners in EMEA (Europe, Middle East, Africa) who are serving the manufacturing and mechanical CAD division. Jordi Portella, Autodesk's Director of EMEA Manufacturing Solutions and his team put on an excellent almost week long event that was attended by over 550 mechanical and manufacturing partners and specialists. While this is something that I was delighted to do, unfortunately I had to sandwich this between meetings in San Francisco on Friday and Orlando on Wednesday, so I was only in Salzburg for about 18 hours, but it was a great reminder of the phrase “short but sweet”. I landed in Munich and took the train to Salzburg. It was one of those magical rides on a gorgeous spring day through the green hills of Austria and Germany, complete with church steeples marking the small villages and towns, and with freshly snow-covered mountains in the background. I titled my keynote address “The Snowflake Effect: Unique is What We Seek”. I used this opportunity to highlight the trends, directions, and patterns that I feel are leading inevitably to a universal focus on the uniqueness of not only each of us as individuals, but even more so, the uniqueness of every moment, situation, and project. Getting to “just right”, as in finding just the right people, content, context, mediums, etc. Thinking more UNIVERSAL, rather than NATIONAL when it comes to the skills, knowledge, and capabilities of the future. Developing execution strategies that adapt and adopt these to leverage local, national, and cultural contexts. Shifting towards RIGHT BRAIN dominance in our jobs and skills. Our left brain still very necessary, just not sufficient. Ever wary that we are very busy “perfecting the irrelevant”. I’ve previously covered some of these topics here on Off Course – On Target and will be addressing much more to do with the role of design, skills for the future, and some of these profound and powerful trends that are affecting the future for all of us. Stay tuned for more, send in your comments and suggestions and look forward to seeing you here more often.